When I saw a recipe for banana ginger cake chez The Caked Crusader the other day, I knew there was nothing to be done but make it as soon as I could. Banana and ginger is not an obvious pairing by any means, but the cake just sounded so good – and it was. The original recipe came from the prince of bakers Dan Lepard. I tweaked it quite a bit, of course, but the glory of this sticky banana ginger cake must go to Dan. It’s one of those quick and simple cakes to make which can be mixed by hand in under fifteen minutes, so brilliant for when you’re in a rush. I added quite a bit of ground ginger, which wasn’t in the original recipe as well as a little cinnamon. I also used wholemeal spelt flour and olive oil rather than sunflower oil. 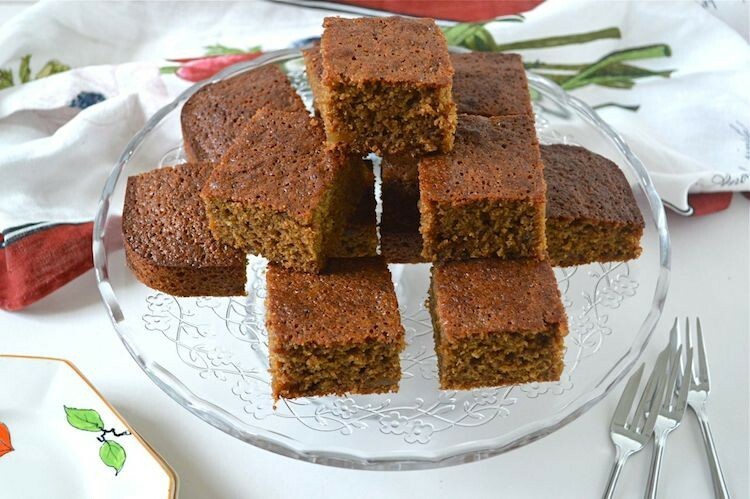 As I quite like my ginger cakes to taste a little treacly, I also mixed up the sugar to include some really dark and less refined molasses sugar. The finished cake is astonishingly light and springy, given it’s made with bananas and wholemeal flour. It also has a lovely sticky texture and holds together well – there are few crumbs with this cake. CT reckoned the balance of banana and ginger was just right as he could detect both well, without one overwhelming the other. But it also had the desired gingery heat I was looking for. Another brilliant wholefood cake to add to the Tin and Thyme top of the pops recipe collection. A quick and simple traybake, with a sweet banana flavour, treacly notes from the sugar and a hit from the fiery ginger. Ideal finger food with its sticky but springy texture. In a large bowl, mash the banana with the two sugars. Beat in the eggs, one by one, followed by the olive oil. Sieve in the dry ingredients and fold in carefully. Gently stir in the bits of ginger. Pour into a 22.5 cm / 9"sq silicone mould or lined tin and bake at 170℃ for about 40 or until the cake is risen, golden on top and firm to the touch. Leave to cool, then turn out and cut into 16 squares. The original recipe was made in a 20cm / 8" sq tin. If you use this, the cake will be deeper and you'll need to bake it for longer. Works out at about 100 calories a slice. The theme for Love Cake this month over at JibberJabberUK is Sport Relief. Whilst this sticky banana ginger cake wasn’t baked for this purpose, it would make an excellent cake for a bake sale. Thanks for visiting Tin and Thyme. 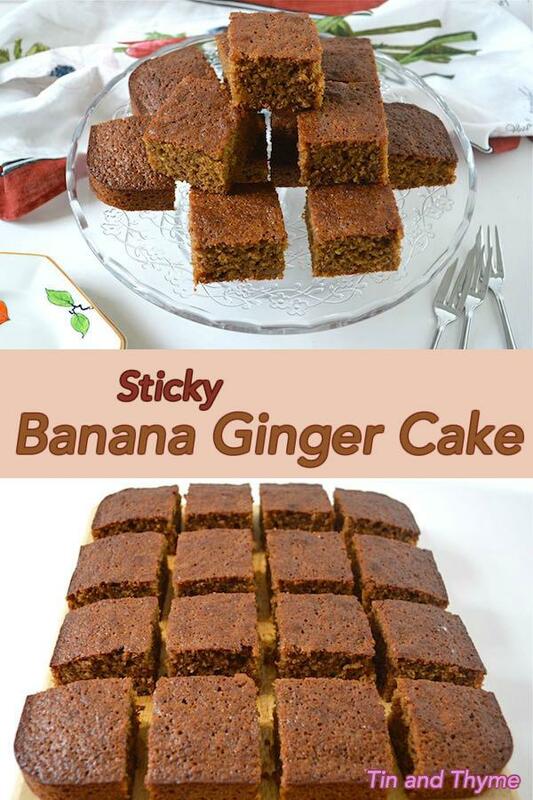 If you make this sticky banana ginger cake recipe, I’d love to hear about it in the comments below or via social media. Do share a photo on social media too and use the hashtag #tinandthyme, so I can spot it. For more delicious and nutritious recipes, follow me on Twitter, Facebook, Instagram or Pinterest. Sticky Banana Ginger Cake. PIN IT. Sounds yummy. I would love to know how many calories this has? So I know how much I can eat per day! Hi Tessa. Glad you like the sound of it. Each slice is about 100 calories. Hope that helps. Reads like a good recipe. And it sure looks good too ! I’ll put it on my ever growing list of things to try …. What is molasses sugar ? Never heard of it. Can it be replaced by something else ? I only know molasses in a jar, like a syrup. If I’d make it, I probably would use less baking powder and replace the oil with butter. Somehow oil in cakes doesn’t work for me; it actually makes me feel a bit sick. Recently I have found (and adapted, of course) a delicous recipe for carrot cake with butter instead of the usual sunflower oil. Ah you have a list like mine! Molasses sugar is the darkest unrefined sugar, so just use dark moscovado instead if you can’t find it. I’m generally not a great fan of oil in cakes, but I do like the texture of this one. Prefer olive oil or rapeseed oil to sunflower though. Hi Choclette, yesterday was the day to make this cake ! No bread in the house, so I had a good excuse to have a slice (ok, it was 2 of them) for breakfast. It was delicious. The banana works so well with the ginger. As usual I altered quite a few things. The most important ones were to replace the oil with 75 g of melted butter and 50 g of Greek yoghurt and to reduce the baking powder to 1.5 tsps. The cake was still well risen, but probably somewhat denser dan yours. This afternoon I am getting friends over for tea, so I can use them as guinea-pigs to test this cake. Hopefully they like banana and ginger ….. Thanks Kate. It’s a surprisingly good combination and a very nice cake. I’ve just had a piece after two days away (4 days after baking) and it tastes as good as ever. I have a lot of love for the banana at the moment. I’ve just baked them into hot cross buns and they’re phenomenal so I can imagine how well they work here. They do look so light and spongy. I think they sound like the ultimate combo. Gorgeous! Dom, you’ve always been into bananas. Love the idea of baking them into hot cross buns. Will be heading over to look as soon as I’ve caught up a bit. Thanks Emma, the flavours work surprisingly well I found. What a delicious cake, it sounds so sticky and treacly. In fact I would love a slice now. Yum! Mmmm this recipe is gorgeous! 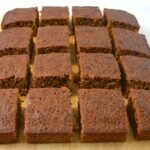 I’m a big fan of ginger cake, and I am loving your tweaks! Thanks Elizabeth, it’s one of those keeper recipes I reckon – so quick and easy. Oh gosh, even just the name of this recipe makes me want to eat it. And at 100 calories a slice, you can’t go wrong! Thanks Becca. I don’t count calories, so I’m not sure if this is good or bad. Someone asked me, so I thought I’d better find out. Gingerbread banana cake…that sounds just too good to miss in life! It really is awfully good Angie and so light for 100% wholemeal flour. Thanks Jo. I’m not used to banana bread being quite as light and springy as this one, but I think it might now be my favourite. Baked this yesterday, left to cool overnight as was going to finish with some drizzled chocolate. This morning half of it is missing! My guess is that the menfolk of this house are giving it a very good thumbs up! You’re welcome. I have had a little taste and can confirm that it is delicious! I might be tempted to drizzle with chocolate drizzle and Cornish seasalt flakes. Omnyomnom! Oh Choclette – your cakes always look SO GOOD and I want them RIGHT NOW. Haha, I’ll work out a price and get back to you 😉 Thank you so much, you’re comment has really cheered me up. Yes good point Dannii. I now remember we always had ginger cake on Bonfire Night. Aw thanks for letting me know Diana. Glad you liked it and a good reminder for me too.